Sloane Manuscript, collection of medical manuscripts, end of the 12th century - British Museum, London The surgical treatment of epilepsy is not a recent innovation. 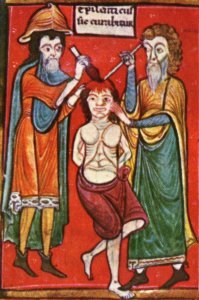 As early as ancient Greek and Roman times, and in the Middle Ages, trepanation (the opening of the skull) was occasionally carried out on people with epilepsy. There were many different reasons for doing this, however. There was seldom a rational, medical reason for the operation, for instance to raise a piece of the skull cap which had entered the inner part of the skull as a result of an injury, perhaps in war, and which was thought to cause epileptic seizures in the patient. In such a case, the surgeon tried to raise the piece of bone and thus remove the cause of the epilepsy. Mostly, however, there were mystical, superstitious reasons for the trepanation operations which were performed. It was thought that opening the skull cap would cause the demons of the sickness, poisonous gases or disease-causing juices to escape. The practice of cauterisation was based on the same beliefs. In this picture, the person with epilepsy ('epilepticus') is undergoing both procedures - trepanation and cauterisation - at the same time.